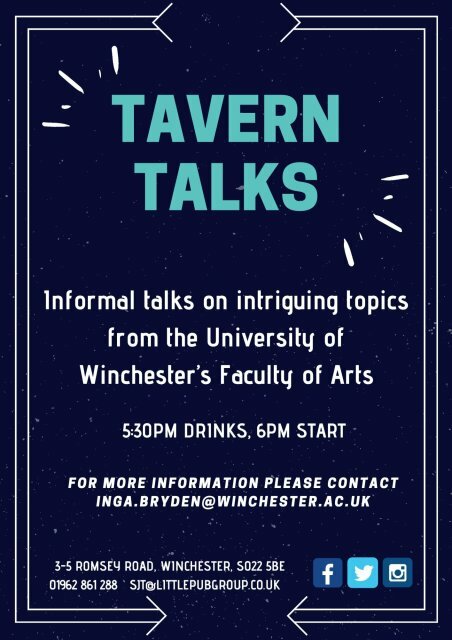 "Tavern Talks takes place on one Thursday a month-they are monthly informal talks on intriguing topics from the University of Winchester's Faculty of Arts. They are free to join but spaces are limited. 5:30pm drinks for 6pm start. For more information please email inga.bryden@winchester.ac.uk"
Unfortunately, due to unforeseen circumstances we have had to cancel April's talk with Daniel Varndell. We hope to rearrange this for later in the year- we will keep you posted! 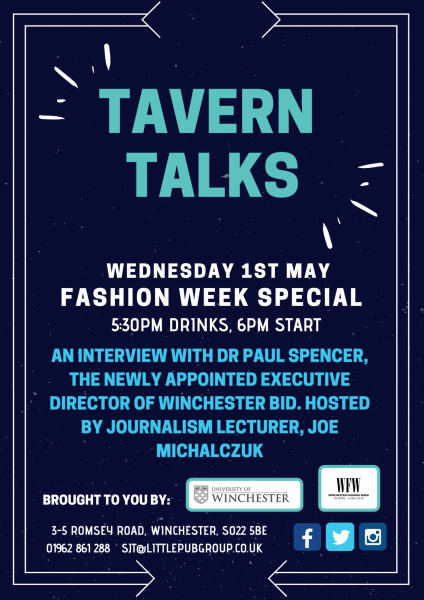 However, we do have a fashion week special on Wednesday 1st May with Dr Paul Spencer from Winchester BID who will be interviewed by Winchester's Journalism lecturer, Joe Michalczuk.